Huntington Proposes Opening Almost All Town Parks to On-Leash Dog Walking! Specifically, the resolution amends Town Code by eliminating wording that prohibits dogs in most town parks and instead adopts uniform park standards with the following words: The Town Board has approved on-leash walking of dogs in town parks and trails. The resolution also requires that dogs be on leashes no longer than 6-feet in length and that dog waste be immediately picked up and disposed of properly. The main exception to the proposed new policy is Heckscher Park in Huntington Village. LI-DOG has strongly recommended that on-leash dogs be permitted in Heckscher Park. Access to Heckscher Park is the most common request we hear from Huntington dogs owners and allowing on-leash dogs in the park would deter the geese who foul the lawns and paths in that park. However, Town officials have expressed concerns about potential conflicts at the park, especially during the day when the park is busy. LI-DOG is optimistic that once the new policy has been put in place and been successful, we can ask the Town to revisit this restriction. LI-DOG is excited about the proposed change in the Town Code and supports the Town Board resolution. Opening virtually all the Town’s parks to on-leash dog walking will benefit tens of thousands of town residents and their dogs! Moreover, the change in policy will serve as a positive example to other Towns on Long Island that still ban dogs from public parks. In introducing the resolution, the Town Board notes that adopting uniform standards for leashed dogs in town parks supports Huntington’s goal to be more dog-friendly “by allowing more Huntington residents to enjoy public parks with their canine companions.” The Town also notes that allowing more people with dogs into public parks promotes public safety by having more “eyes” on the parks. In making its recommendation, the Trails Committee noted that 2013 initiative has worked well and that there have been no issues to date with on-leash dogs on trails in public parks. In lieu of individual site designations, the Committee noted that the adoption of uniform park standards will make it easier for people to understand the policy towards dogs in town parks and will help increase park and trail use. In addition, the Committee noted, the Town owns almost a dozen parks in conjunction with Suffolk County and those partnerships are likely to continue to grow. County policy, which takes precedence in these parks, allows leashed dogs in its parks and adopting uniform standards will align Town policies with the County. 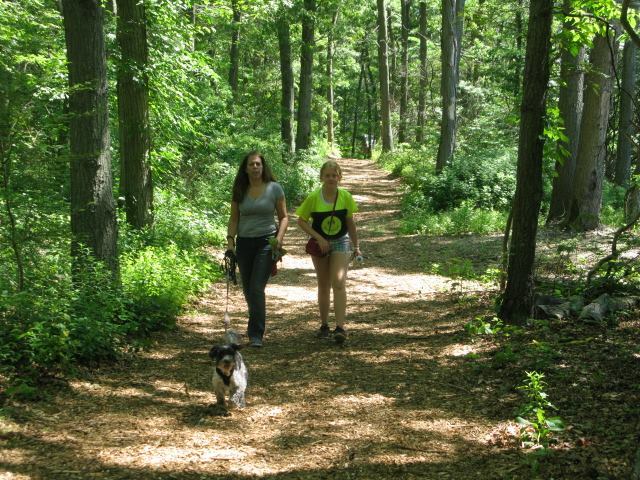 Besides the exception of Heckscher Park, the resolution also restricts on-leash and off-leash dogs from: Betty Allen Nature Preserve, all playgrounds, picnic areas, active recreation areas like sports fields, town camp programs and town beaches. Significantly, on-leash dogs are permitted on paved areas and boardwalks at town beaches. Again, LI-DOG is optimistic that once uniform park standards are adopted and the program proves successful, we will be able to ask the town to revisit the restrictions on Heckscher Park as well as access to beaches. LI-DOG is asking dog owners to join us in support of this resolution that significantly expands access to parks in the Town of Huntington! Join LI-DOG at the Public Hearing at the Town Board Meeting on Tues., July 11th at 2 p.m. While we view this resolution as a great benefit to town residents, there are always a few critics who will oppose the resolution. Come to the Town Board meeting on July 11th and show your support for access to parks! If you can’t come to the Public Hearing, email or call Huntington Town Board members and let them know you support Local Law Introductory Number 31-2017 that will allow on-leash dogs in Town parks. Don’t forget to cc: lidog_news@yahoo.com so we can see your emails, too! Make sure to send a copy of your email to Huntington Town Clerk Jo-Ann Raia at jraia@HuntingtonNY.gov, so that your message is entered into the public record in support of the resolution. The more emails the Town Board gets supporting their resolution, the more likely it will pass! This is a great step forward for Huntington dog owners! Thank you for your support!